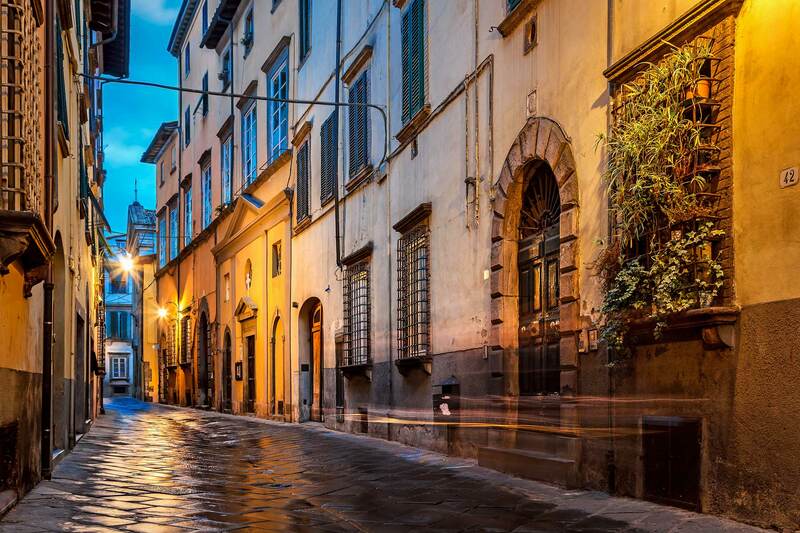 Anyone looking for a quintessential Tuscan escape should have Lucca in their sights. A mere hour and a half from Florence by train. Looming renaissance walls lining cobblestone paths. Authentic delicacies made from organic produce brought in from the surrounding countryside. And of course, an awesome concentration of astounding architecture, especially for such a small space! 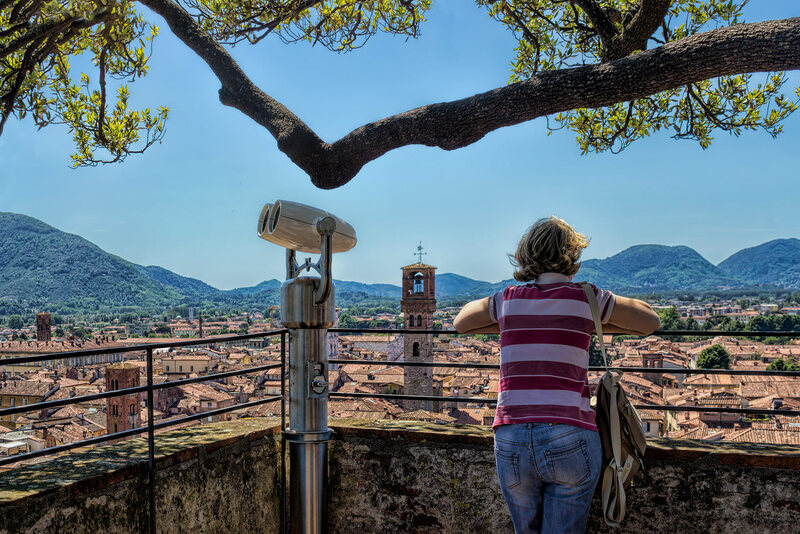 Here’s a list of the top sights in Lucca, but be sure to check our our suggestions for an off-the-beaten-track experience below! 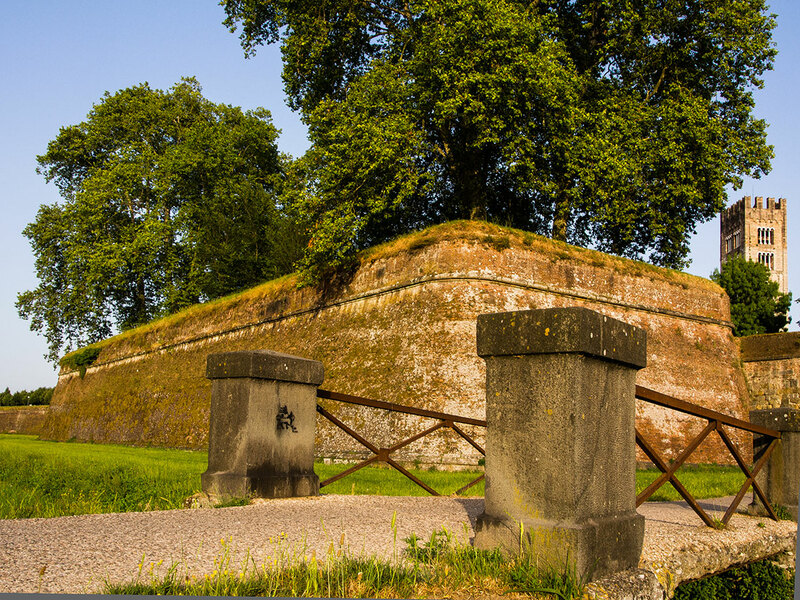 Lucca is known for its well preserved Renaissance city walls and cobblestone streets. 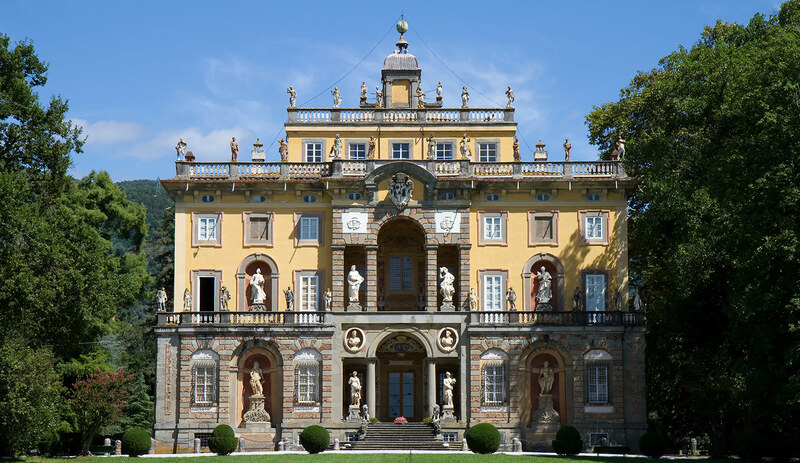 In fact, there are 4 kilometres of foliage-topped ramparts and hideaways to enjoy. You can explore a portion of these ramparts at the Orto Botanico (botanical gardens). The ancient ramparts of Lucca, inside the Orto Botanico. 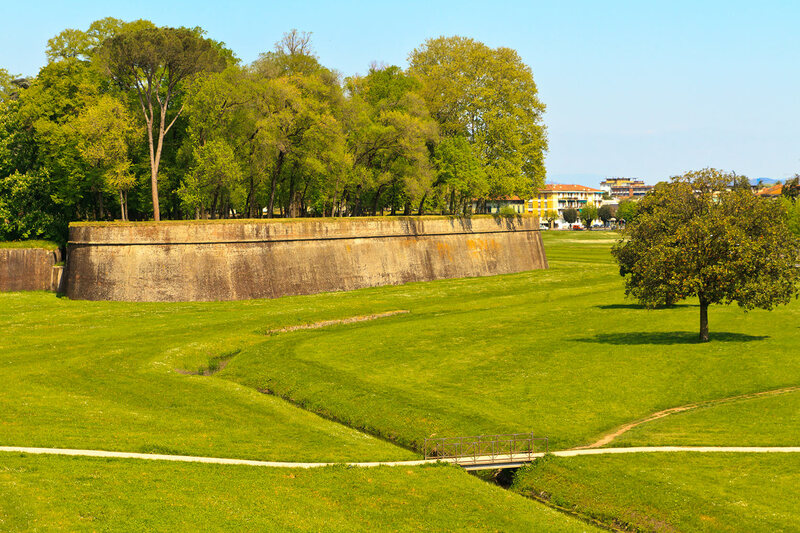 More of the trademark Renaissance walls in Lucca, Tuscany. 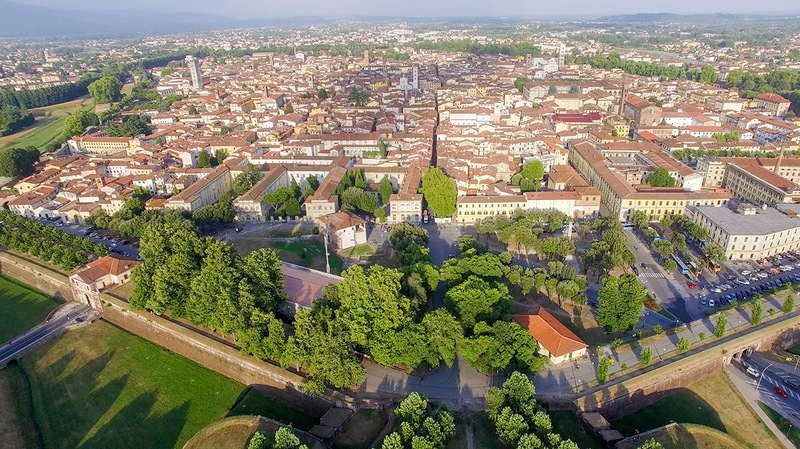 Lucca’s historic city centre, and the renaissance wall surrounding it. After that it’s time for another classic Lucca experience. That’s right, a church! 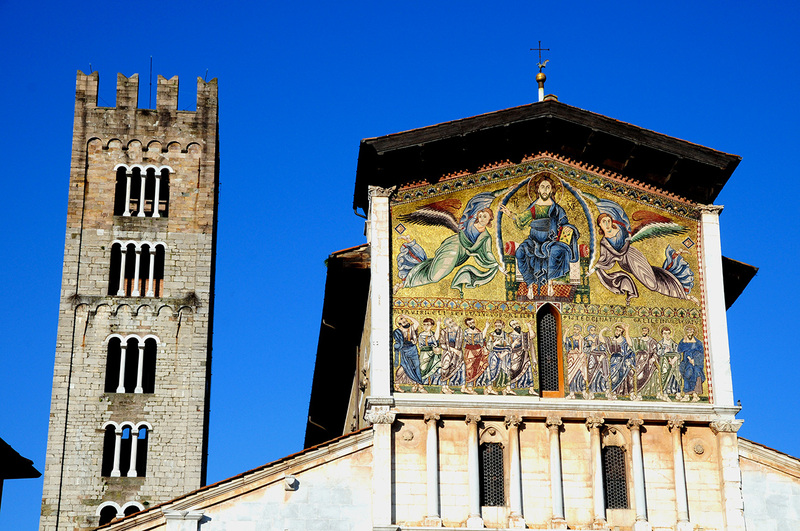 After all, Lucca is also known as the ‘City of 100 Churches’. You can’t really get away with not visiting at least one. 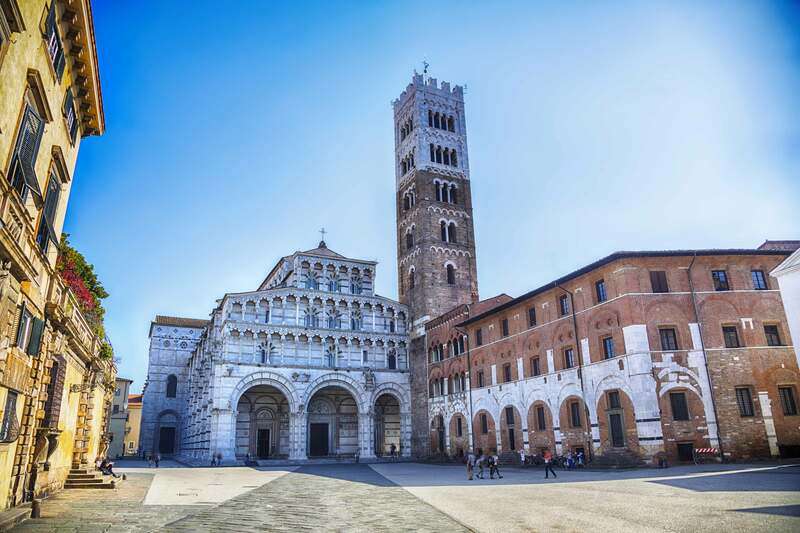 The Cattedrale di San Martino, on the piazza of the same name, is the perfect place to start. Inside the Cattedrale di San Martino, Lucca. Piazza di San Martino, Lucca. 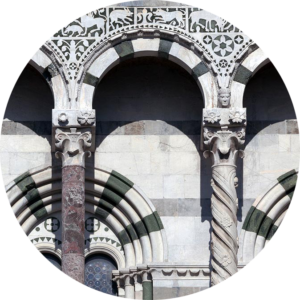 Each column on the Cattedrale di San Martino in Lucca is different. 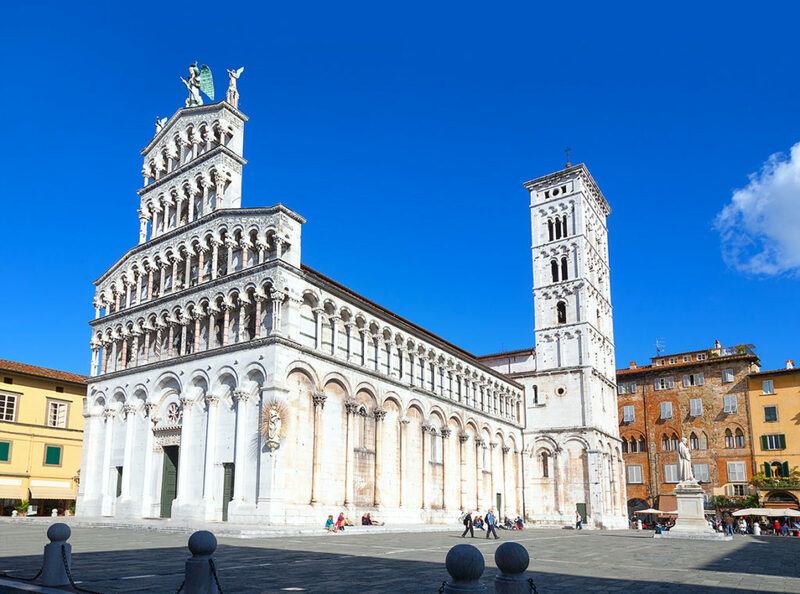 The Lucca Cathedral, as it is also known, hosts several masterpieces from the art world. Visit Jacopo della Quercia’s earliest extant work, The Tomb of Ilaria del Carretto. At the same time, you can also see Madonna and Child by Domenico Ghirlandaio, who once tutored da Vinci! 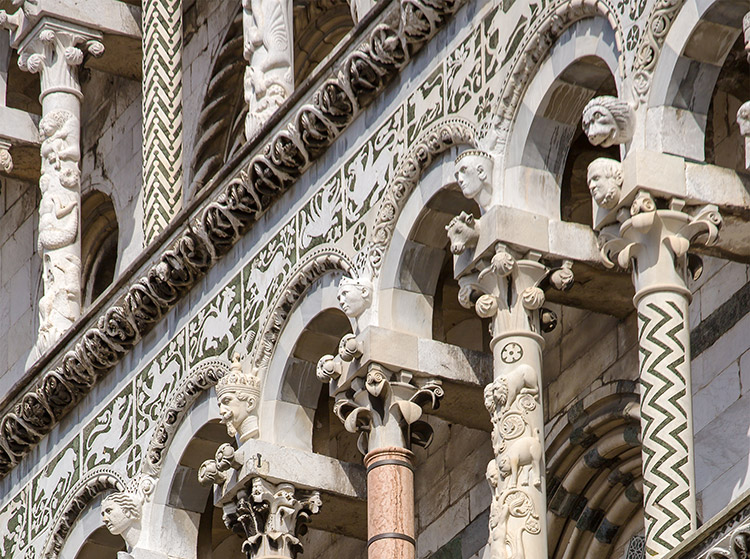 As can be seen, each column on the Lucca Cathedral’s facade is different. The city has a legend about how this came to be. The citizens held a contest, where local artists designed and submitted columns for the cathedral. Instead of announcing a winner, the people chose to use them all, without paying a single artist! 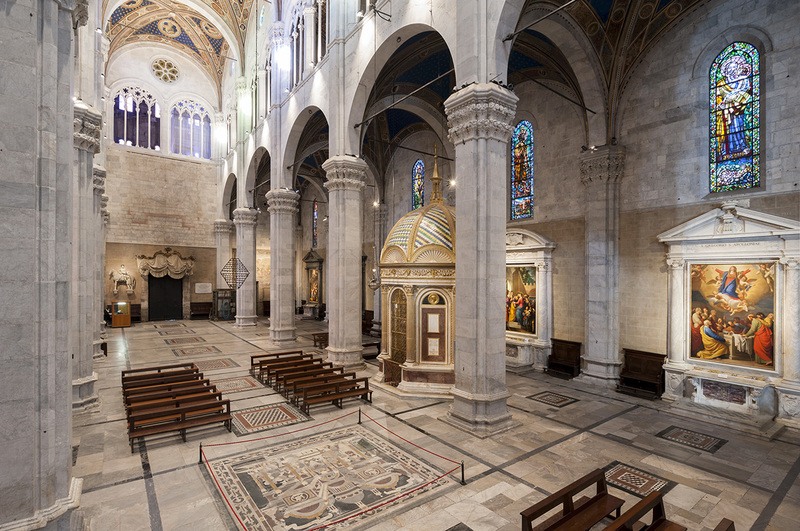 Another must-see church is the 14th century Basilica of San Michele in Foro. It was built over an Ancient Roman forum, and was once the seat of the Major Council. As with the Lucca Cathedral, each column on the basilica’s facade is different. 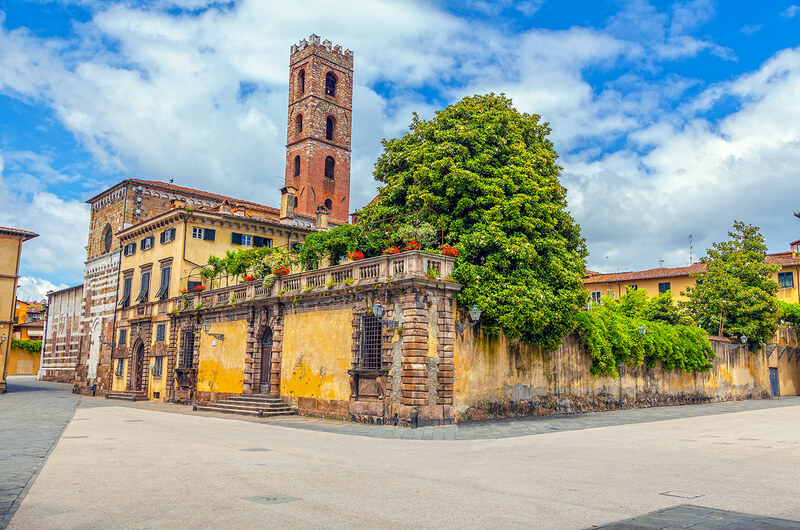 What’s more, the basilica just happens to be five minutes away from Lucca’s famous shopping street, Via Fillungo! The Basilica di San Frediano isn’t just a pretty church. It also houses the 700-year-old, naturally mummified body of ‘The Incorruptible St. Zita’. Saint Zita is Lucca’s patron saint. She’s also the patron saint of domestic servants. Her entire corpse has been preserved, with haunting efficiency, and rests inside the basilica. Don’t quite have the stomach for it? Wander the stunning basilica instead. Its interior consists of stunning white marble carvings. 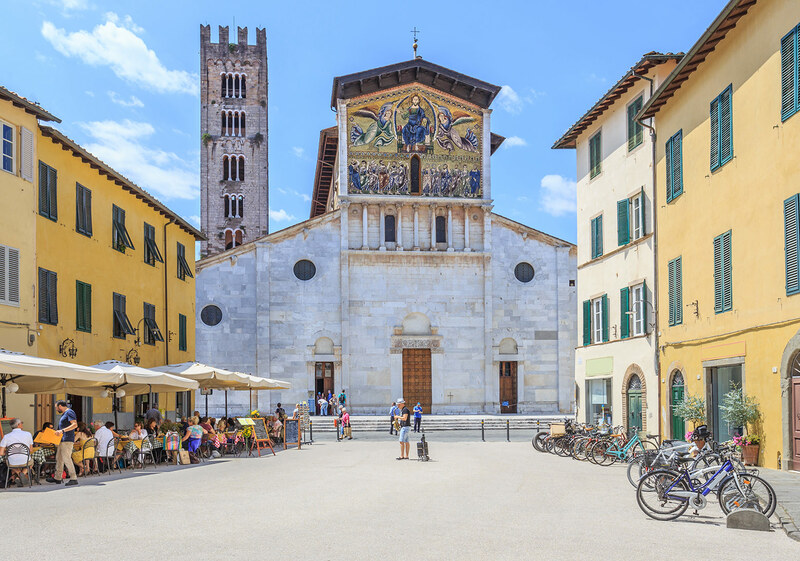 The Basilica di San Frediano, on the piazza of the same name, Lucca. 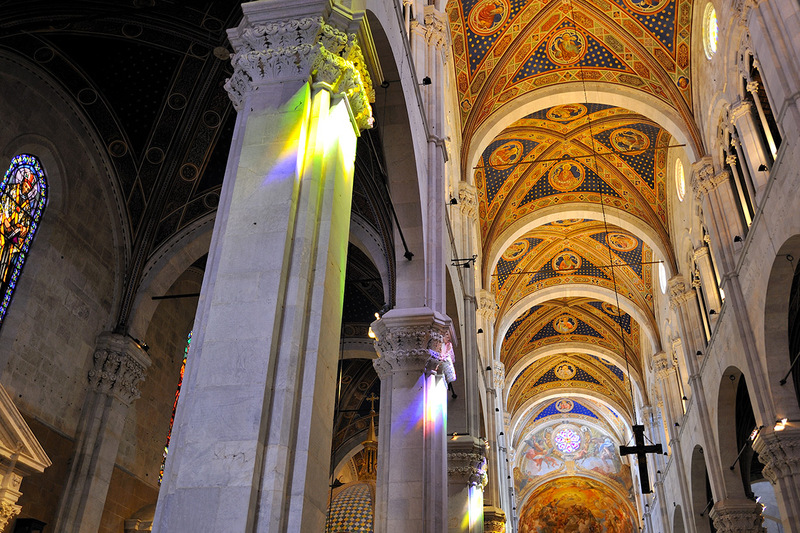 A close-up of the Basilica di San Frediano, Lucca. Lucca once had hundreds of towers. Today, few remain. The most important is probably Torre Guinigi, which is a typical example of the local Gothic architecture. In addition to its 14th century history, the Torre Guinigi offers a unique attraction for tourists. At the very top, you’ll find a rooftop garden of Holm Oaks. These trees are at last 400 years old, and frame one of the prettiest 360 degree views of Lucca out there! 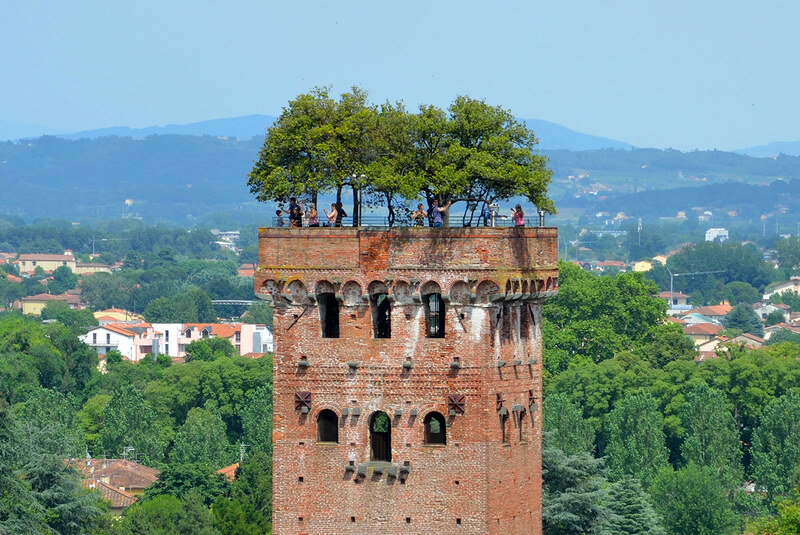 Four hundred year old Oaks on top of the Torre Guinigi, Lucca. 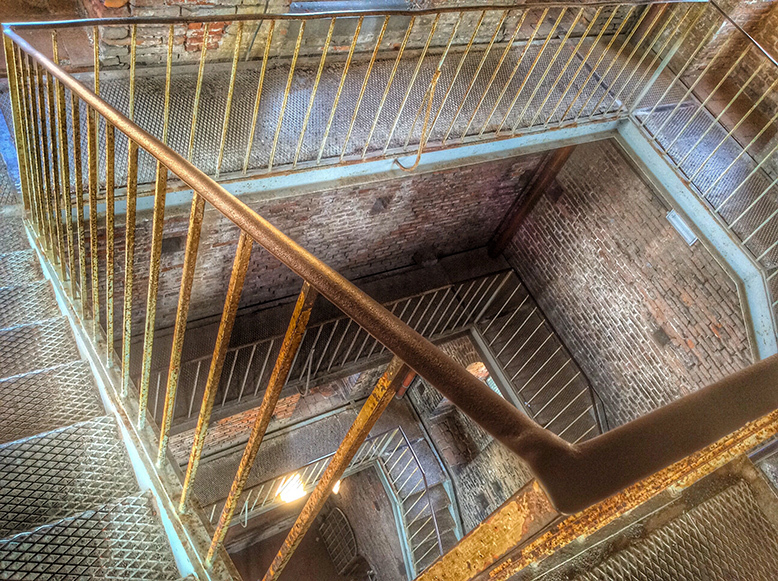 Inside the Torre Guinigi, Lucca. A journey to the centre of the Earth! Outside of the city of Lucca (but still in the province of Lucca), lies the town of Levigliani. Here you’ll find the largest complex of karst caves in Italy. The Antro del Corchia (Corchia Caves) are not only breathtaking, they’re also technically a fossil forest! Planning a trip to Tuscany? See our guides to Florence and Siena! Villa Torrigiani di Camigliano, an hour outside of Lucca. 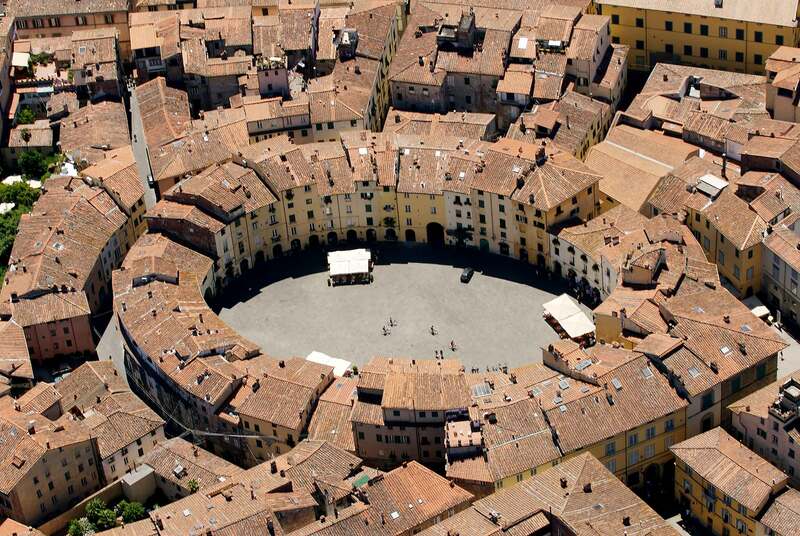 A bird’s eye view of the Piazza dell’Anfiteatro, Lucca. 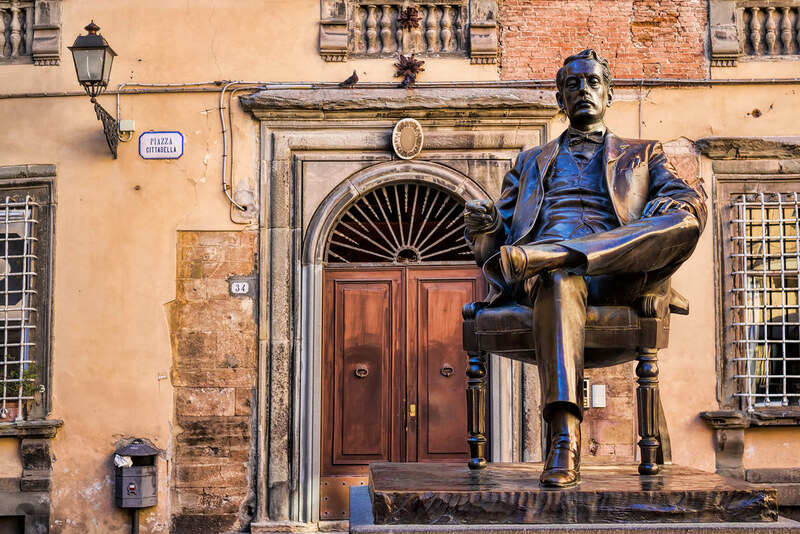 The statue of Puccini on the Piazza Cittadella, Lucca.